They have 3-5 stages each. I know, that is a physical impossibility, because cards only have 2 sides, but whatever. Laws of physics are too disillusioning for my taste anyway. 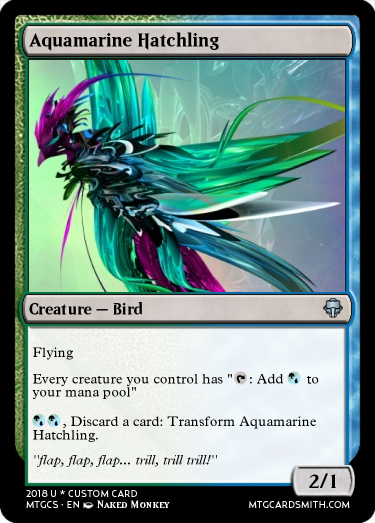 Make a card that transforms into another card, which transforms into another card, that's it really. Honourable mentions!!!! (I will pick from 2 to 5, depending on how many entries we can get): 5 favorites and a mystery ticket. "But what on earth are the mystery tickets?" I hear you cry. Now go, forge the greatest cards you can think of! It is my opinion that we shouldn't come up with new meanings for existing functions, such as "transform." When transforming an already transformed card it goes to the original side not a new side. So Faiths_Guide is right here. That and I agree with @Faiths_Guide. 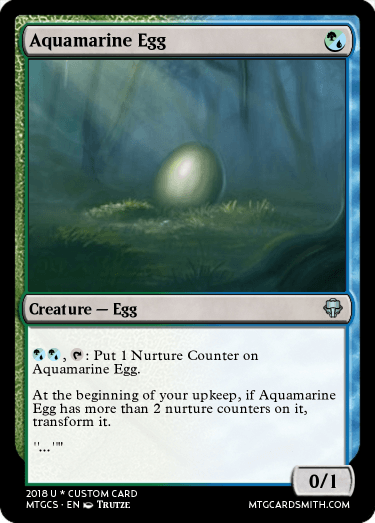 Intentionally or not, you are redefining an existing meaning in MtG. 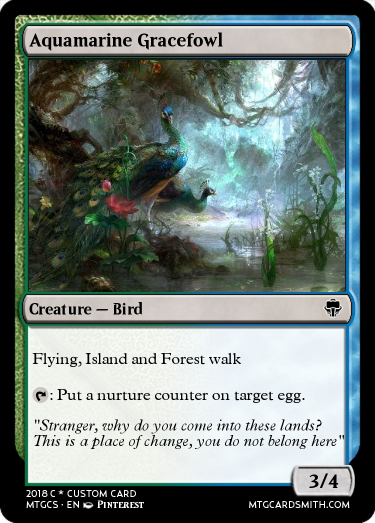 @HeroKP Instead of transforming, how about just "When (the requirement is met) exile this creature, then search your library for a card named X (the transformed creature) and put it onto the battlefield." since transform seems to be too complicated for more than one instance. Also, our discussion that followed over the next few comments should prove enlightening. I suggest using the wording but putting somewhere that the cards they transform into are not meant to be part of your deck. Maybe use the word "token"? But token legendaries can't exist, can they? Oh well, the whole thing was broken anyway. Feel free to close this contest, as it won't work. Token legendaries exist. Marit Lage from Dark Depths is one. Karox Bladewing from Verix Bladewing is another. I would word it like (Cost, Exile this: Create a legendary token named X with its abilities). If the abilities are too long, you can just list keywords and leave out the rest I suppose. Another way to do it is non-pure transformation where the transformation cards are playable cards by themselves and the previous card searches for them. For example Gate to the Afterlife -> God Pharaohs Gift. OK, SO THE CHALLENGE IS STILL OPEN - THE CRITERIA IS WHAT FISKERTON SAID! @HeroKP Then change the rules above. And plus make some examples out of it por favor. Actually, I have a much better idea for a contest!